You get 1 CHANCE and 3 SECONDS to make a good impression. you updated your makeup bag colors that suite you best? Request what time between 3pm - 8pm work best for you. Not all minerals are created equal. Conventional makeup and mineral lines include fillers such as talc and dyes that pull the moisture OUT of your skin, leaving the skin feeling tight and caky. Other mineral lines also contain nano-particles, which leach into the bloodstream - in which you both loose your coverage and put your health at risk. 80% of AGING is from UV rays. an SPF 50 - on the daily. Amy’s worked with the Prestige line as a top leader with Estée Lauder Companies for over 18 with many additional roles such as a lead Account Executive with multiple retailers. Amy's passion is to help woman learn about the benefits of safe, high performance makeup and for them to feel their best. "La Bella Donna products offer natural, prestige, affordable and makeup with skincare benefits perfect for any women of every age. SUMMER HAPPY HOUR MAKEOVER EVENT! *Update your color palate - no guessing games on knock-out accents just for you! Request what time between 4:30 - 8pm work best for you. As the summer gets on it's way, let's make sure our SPF facts are up to snuff. Let me count the ways! Starting with the fact that 90% of visible signs of aging are caused by the sun. We are exposed to the sun daily (including UVA rays you might not notice) and your body counts sun exposure cumulatively. We may get wiser over the years, but we also collect more sun-time. And the damage shows up many, many years later. Containing ingredients like avobenzone, homosalate, octinoxate and others, chemical sunscreens absorb the sun’s rays, transform them into heat, which is then released from your skin. ‘Chemical’ sounds like a bad word, but it’s not here – it just describes how it functions. Chemical sunscreens take about 20 minutes to activate after application, so lotion up before heading out. Physical sunscreens are ones with zinc oxide or titanium dioxide and work like a mirror, deflecting the sun’s rays from your skin. They can be less likely to clog pores, cause less allergy issues, and are ideal for everyday use, especially on your face. And they’ve come a long way from the white-nose days, so don’t worry about that. Protection is instant once applied. The A and B letters are scientific, but all you have to remember is A for Aging and B for Burning. UVB rays cause familiar results – sunburns. UVA rays do quieter damage, causing wrinkles, skin cancer, and visible signs of aging. UVA rays come through clouds and windows, which is why we preach daily sunscreen. Sunscreen labeled ‘Broad Spectrum’ protects against both UVA and UVB rays. If it’s not labeled as such, chances are it’s only covering UVB rays (think: your less expensive body sunscreens you’ll find at the drug store). You’re best off with Broad Spectrum to make sure you’re covered, especially when it comes to your face. Sun Protection Factor (SPF) is a standard laboratory measurement of a sunscreen’s ability to prevent UVB damage to our skin. (Important distinction, it doesn’t measure the impact of those aging UVA rays.) If it normally takes you ten minutes to burn, generously-applied SPF 30 would keep you from burning for 300 minutes, or about five hours. (Usual Time To Burn x SPF = Protection Time). Our take? Math is not fun at the beach, so do yourself a favor and just re-apply often and liberally. Conventional wisdom says a ‘shot glass’ worth over your entire body, although I suggest a bit more. All depends on height and weight. Apply more frequently if you’re sweating or in and out of the water. Over or used as makeup? I'm a big fan of straight up sunscreen as a foundation with SPF to ensure coverage. Our clients love our Tinted UV Protect 35 SPF facial lotion that is incredibly light and lightly tinted to blend into most skin types (haven't found anyone yet that it has not). The other great option is to dust with our La Bella Donna Minerals to assure protection at a 25 SPF and non-nano, so that you do not loose your makeup (and coverage) through your pores throughout the day. When was this stuff invented? Want to sound smart at your summer barbecue? The first major commercial sunscreen was sold in 1936, by the founder of L’Oreal. Ten years later, it improved dramatically for soldiers in World War II. “SPF” as a standard was adopted in 1974. And before all that, ancient cultures used olive oil, rice extract, zinc oxide, and other compounds for thousands of years. After all that, do you need some sunscreen? Visit Evoq Beauty for our selection, or book a facial and pick up some in person. The change of seasons call for your makeup to be applied with a heavier hand. Your lusting makeup bag is calling for a update to level-up your inner and outer bold confidence (we know its in you)! Stop by BE anytime or grab a RSVP with our makeup artist and we’ll make these simple and glam looks -personalized and easy! Hello beautiful! We're bringing a little makeup inspiration as we officially move out of a long-standing trend of nudes, golds and makeup-LESS face. We all know that makeup can warp us back to a time in history. I had to laugh when putting this archive together with our incredible skin expert, TAYLOR. Taylor was teenage-ing in the 90's and loves these looks as it reminds her of the 90's grunge look. While I squirm a bit when I think of Kirt Cobain, my reaction is lifted as I attribute these rich makeup tones back to the 70's when the disco ball was well and running at Studio 54. Want to really get into it? I found two tutorials to re-create the 90's grunge or a night at the 70's disco. Ok - back to 2016. Stay on trend with these winter makeup statements of bolder hues that pop out any lip, cheek and eye shape. Step outside the box (more like your makeup bag) and gather a few spellbinding and glam makeup effects with these enchanting palettes in tones to suit every mood. Think deep ruby reds, sinfully dark violets, dare I say the darkest of sapphire blue? The color of your lips can change an entire look. If you haven’t tried a dark lip, get sassy or classy with a standard berry base and opting to apply a darker shade over top – this will blur the darkness to a medium shade. Ease into it - you may learn to love it. We’ve come a long way from the toxic mercury, synthetics-based formulas of the past century and methods of grandma’s time. Between stains, creams, and powder - choosing the best color can be in and of itself confusing. Get the quick rundown. To perfect your rouge, gently sweep color above the apple of your cheekbone and brush outwards towards your temple (over extending blush past the cheek bone can result in a baby doll look). 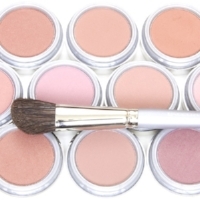 Perfecting your hugh: For winter tones, enhance your skin hughs of a warmer blushed cheek. Think orange, brown undertones or a subtle mauves. Peach can be especially flattering for complexions with yellow undertones, while pink works best for those with pink undertones. Love up on some drama with your day or night look with black liner on your lower lash line. Apply black eye pencil to the thickness and darkness of your liking. Use a q tip or smudge brush in a back and forth motion to pull apart the sharp line for a faded look. Call or Text or simply Email us to reserve a hair, skin or makeup appt today! Are you wearing the best shades that highlight your unique features and skin tone? Spring has sprung, and it's time to clean up the beauty bag! 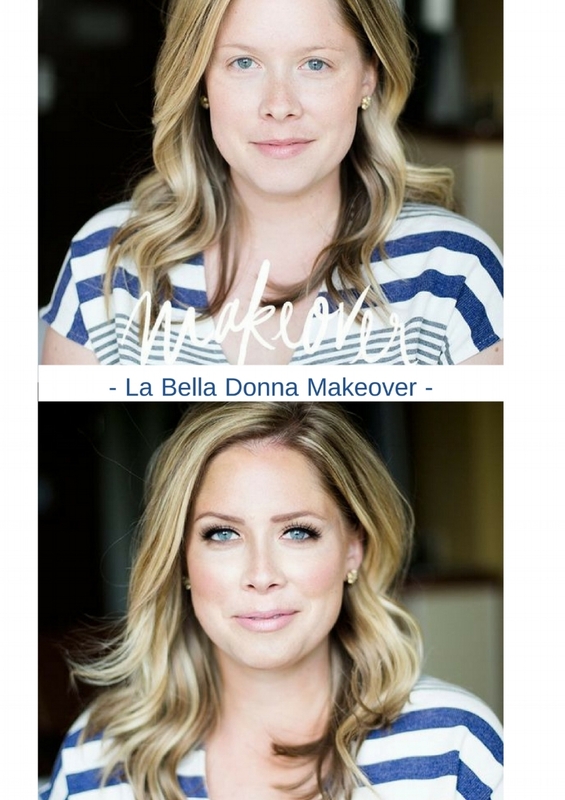 La Bella Donna's national makeup artist, Jennifer Honeycutt will be providing personal makeover sessions, tips & techniques to help you to enhance your best features. Weightless, age-defying, safe mineral alternatives! Choose appropriate and trending new colors that look best on your skin tone! Reserve your personalized mini makeup makeover for $25 and we will put $10 toward your makeup purchase! *Leave the time of day that works best for you and we will do our best to accommodate. Appointments will go fast, so please confirm as soon as possible. Payment for appointment may be paid the day of your makeover. Please be considerate of cancellations 2 days prior to Thursday. National Artist Jennifer Honeycutt and our own Amazing Rachel will work with you step by step to achieve the best look for the season! Pigment Rich Beauty Bag Swap Out with La Bella! SUN-KISSED BRONZER for contouring or to be "kissed by the sun!" Incredible BONUS SAVINGS for YOU on May 22nd Only! Schedule a o2 Red Carpet Oxygen Lift Facial & receive $20 OFF! 20% OFF any 2 + Kasia Natural Skin Care Products! FREE Hair Cut when you pre-book a color on May 22nd! First Time Clients Only. About Jennifer: Leaving Channel and MAC in the past, Jen obtains a Medical Esthetics license and has worked closely with a team of leading Plastic Surgeons focusing on the health of the skin. Certified by the International Dermal Institute and educating for Dermalogica, where Jen helped grow business as well as developing educational courses throughout the Mid West. A fast alternative to time consuming and expensive Lash Extensions! By far the BEST & safest Fibre Eyelash Extensions! I like how it contains all natural ingredients with the key ingredient being the HIGH GRADE beeswax! It makes sure the fibres don't fall off into my eyes or onto my face and really lasts throughout the day! The high grade beeswax also helps stimulates the growth of my natural short lashes too! What Is It: Cherry Blooms Brush On Fiber Eyelash Extensions is an exciting new concept that doesn't require any glue or false lashes. The eyelash extensions are lightweight and comfortable to wear. Best of all, they can easily be applied in 60 seconds. Who Is It For: All skin types. Suitable for contact lens wearers. Suitable for any occasion. Why It's Different: This brush on fiber eyelash extension brand is the only answer to safe and easy eyelash extension that dramatically creates 300% longer and thicker lashes in 60 seconds. Plus, our Beeswax ingredients is of the highest quality. Includes 4 tubes: 2 tubes of transplanting mascara gel and 2 tubes of dry nylon black fiber, which sticks on the the beeswax mascara making it look like you are wearing false eyelashes. Brush On Fiber Lashes uses BLACK fibers made from non-toxic ingredients in its eyelash extensions, which makes it suitable for those with sensitive eyes and contact lens wearers. It’s easy to remove with warm water and a cotton ball. Cherry Blooms Brush On Fiber Eyelash Extensions are lightweight and just as easy as applying normal mascara. Contact our team today to order your Lash Fiber today! Move over Barney, there's a new purple in town! The Pantone Color of the Year is called “Radiant Orchid”—a powerful purple tone that lives somewhere between cold, blue tones and warm, red nuances. Somewhat Fucia but heartier than lavender; less alarming than grape; and too gutsy to be barbie pink. Start early because you're about to see it everywhere…in fashion, cosmetics, hair color, home décor, even wedding palettes. Purple is growing on me, and I can name a few clients that obsessively ADORE! Moderation is a good thing. I wouldn’t buy it in a car, but I could be persuaded to a great spring clutch or a ballet flat, or scarf. Radiant Orchid clothing looks best on a deep redhead; a dark, cool brunette; or a very pale, icy-blonde. Those that want to color their hair purple— well, that's not for the faint at heart. More than anything, you will see these tones ALL OVER the cosmetics counters. This is the best, easiest way to let some of this radiance into your life. Duo-Lip Crayons The natural antioxidants duo-ended crayons are richly pigmented and designed to line, define and enhance your pout. A high level of precision, as well as smoothcoverage. The soft, rich colour pay-off makes this formulation a favorite used among makeup artists. Venti Ann Eye Quad “Star” is the lightest shade of sparkle which can be used as a highlighter below the brow; in the inner creases of the eye and on the lid. Use the depth of “Twilight””in the crease and in the outer corners of the eye. “Night””is a perfect splash of black to create any smoky eye. Use it wet for a liquid eye- liner. A light dusting of “Sweet Dawn””on the cheeks which can also be used as a pop of colour on the eyes. Mineral Light Lip Colour Highest level of mineral pigment for color on the market, followed by Ceramide 2, which is designed to keep lips smooth and protected from the sun’s damaging UV rays. Add a little vitamin C and enjoy the finish of rich, creamy with a satiny texture and lush shine. Get Natural Coverage: Contains no petrolatum, free of preservatives, dyes or lanolin derivatives. Dermatologically approved. I am going to ease in with a few orchid splashes throughout my home and I just may try some plum-up nail polish on my toes as sandal season closes in. Ughhhhh.....Sounds good right about now, doesn’t it?